The 70-year-old businessman and former senator died in a helicopter crash in Norfolk. Three others also lost their lives. TRIBUTES ARE BEING paid to Dr Edward Haughey — Northern Ireland’s richest man — after he was killed in a helicopter crash in England last night. 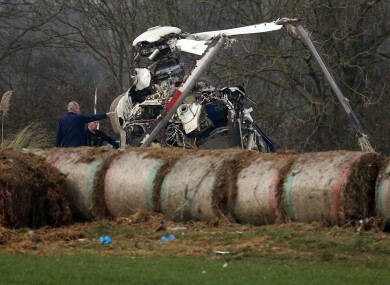 Two pilots and a site foreman at one of Haughey’s companies were also killed when the twin-engined AgustaWestland AW139 came down near the town of Beccles in Norfolk. The 70-year-old, who was named as Lord Ballyedmond in 2004, was founder and chairman of Norbrook, a veterinary pharmaceuticals company. He was also a former member of Seanad Éireann, and a sitting member of the House of Lords. Haughey owned Gillingham Hall, a stately home near the crash site. His personal fortune was worth around a billion euros, according to The Sunday Times newspaper’s Rich List 2013. Tánaiste Eamon Gilmore described the businessmen as “a leading employer who brought many high-quality jobs to Newry in particular” whose influence “spanned both sides of the border”. He took a great interest in Northern Ireland where he made his home and, whilst a member of Seanad Éireann, acted as a member of the British Irish Inter-Parliamentary Body and on the Forum for Peace and Reconciliation. Cathaoirleach of the Seanad Paddy Burke said that alongside his success in business, Haughey “will be fondly remembered for his tireless work in securing peace on the island of Ireland”. The Louth-born businessman and politician was appointed to the Seanad by Albert Reynolds in 1994, and again by Bertie Ahern in 1997. Current Fianna Fáil leader Michéal Martin said this afternoon that his work in the lead up to the Good Friday Agreement in particular marked him out “as an important figure in the progress of peace and prosperity on the island of Ireland over the past two decades”. Norfolk Constabulary received a call at about 7.30pm yesterday from a member of the public who reported hearing the noise of a loud crash. Police were deployed to the scene and began searching the area, with air assistance. All four occupants on board the helicopter were pronounced dead at the scene. The BBC is reporting this evening that the businessman’s company Haughey Air Ltd. lodged a writ against AgustaWestland last year over concerns about the in-flight mapping systems of a helicopter supplied by them. A spokesman for AgustaWestland said it could not comment on possible defects with the crashed helicopter, but that the company was investigating. The site of the crash was sealed off as police investigators carried out initial enquiries, while air accident investigators were also sent to the scene. Early reports suggested that the helicopter may have been heading to Northern Ireland, though police refused to comment on its departure point or its planned destination. Local resident Roland Bronk said it had been “very foggy” in the area at the time of the crash. The crash site is 72 kilometres from where a US military helicopter came down during a training exercise in January, killing four crew members. It is with sincere sadness and deep regret that the Company confirms our founding Chairman and CEO, Lord Ballyedmond, was one of four people who tragically lost their lives in an aviation accident at Gillingham, Norfolk, UK at approximately 7.30pm on Thursday 13 March 2014. Norbrook management and staff also mourn the loss of their friends and colleagues Declan Small (Site Foreman), Captain Carl Dickerson (Pilot) and Captain Lee Hoyle (Pilot). Our thoughts are with the immediate families and friends of the deceased who have requested privacy at this difficult time. We take enormous pride in our Chairman’s extraordinary legacy in establishing Norbrook as a global veterinary and pharmaceutical industry leader. Management will continue to advance his pioneering vision with a renewed vigor and determination befitting his memory. Additional reporting — Sinéad O’Carroll & AFP. Email ““Tireless work in securing peace..”: Tributes for Edward Haughey, following crash tragedy”. Feedback on ““Tireless work in securing peace..”: Tributes for Edward Haughey, following crash tragedy”.